Do you have a tiny little ball of fur at your place? Well, puppies are the cutest creatures on the face of the Earth! And getting a new puppy friend is really exciting. You get unlimited licks, attention, and cuddles from your puppy friend. And, all of your friends come over to see the new member of your family! But, puppies are a lot of work! And, when they start teething, they chew on anything and everything! My doors, tables, slippers, etc. were all destroyed by my little labrador when he was teething! And so, getting a good chew toy for your new puppy should be on your priority list! Today I’ll share the best chew toys for puppies with you. Teething is something we all go through. I just got two of my wisdom teeth and my mouth hurt so bad when they were coming in! Let’s get a little background on your new furry family member’s new teeth, shall we? Let’s talk about the timeline, shall we? But first, don’t panic if your puppy isn’t sticking to this timeline! It’s just a general one. It actually depends on your puppy’s breed as to which of the teeth he’ll get first. When your puppy is 3-6 weeks old, he’ll get his premolars and molars, six on top and 6 on the bottom! Hello, Toothfairy! My Old Friend. The teething process is long for puppies! After the last of those molars come in, your puppy’s permanent teeth start coming out and they literally ‘push’ your pup’s milk teeth out! Your puppy will have all 42 of his permanent teeth when he’s about 7 months old. Permanent teeth replace the milk teeth tooth by tooth while they literally fall off! So, for this long and grueling process of teething, your need to look at the best chew toys for teething puppies. And while we’re at it, make sure that you start grinding your puppy’s nails as early as possible! I don’t know bout you but I feel that tables make everything easier and more systematic. Let me know how you feel in the comments section! To save all of your furniture, papers, and homework, you need to get a good chew toy for your puppy friend! And, I’ve compiled the Top 10 List of The Best Chew Toys for Puppies! I hope this table was informative! Let’s get into the in-depth reviews of each dog toy, shall we? I’ll also be discussing the pros and cons of each of these toys so that you can make the right decision! 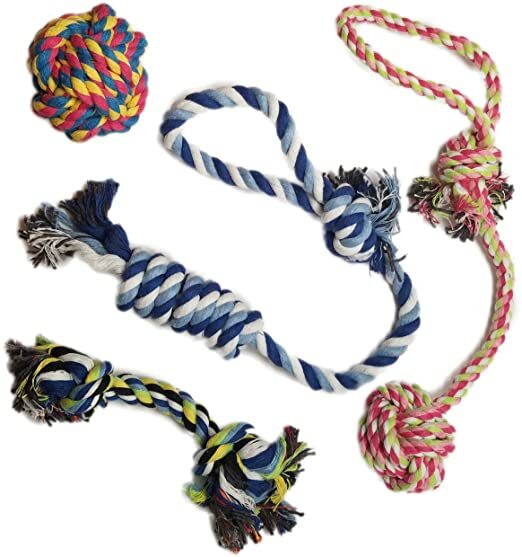 Although I do recommend that you get two or three different chew toys out of these ten best chew toys for teething puppies! Well, so that your puppy has more choices! This means he won’t just move on to your slippers or the newspaper! He’ll stick to his own fun toys! Let’s talk about the best chew toys for puppies in detail, shall we? 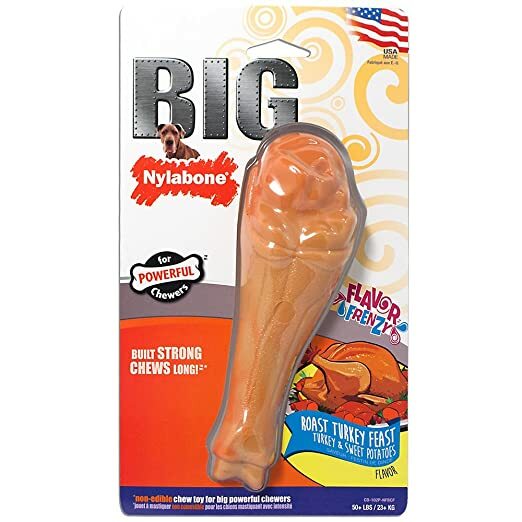 The Nylabone Flavor Frenzy Big Turkey Chew Toy is probably one of the chew toys for puppies available right now. This is highly recommended by a lot of dog owners and it works great for both, teething puppies and adult dogs! In fact, my dog is chewing on this one as I’m writing this! An indulgent flavor which your puppy will enjoy and it doesn’t even have calories! So, you don’t need to worry about your puppy getting fat! Entertains and engages puppies when they get bored and you’re not around! I like the fact that it had a good flavor that keeps the puppy engaged but it doesn’t contribute to getting your puppy gain a few unhealthy pounds! This is probably one of the best chew toys for puppies that you should definitely look into buying! I’m sure your puppy will love it! All in all, this is one of the best toys available for puppies right now! You really should spoil your pup with this new toy! 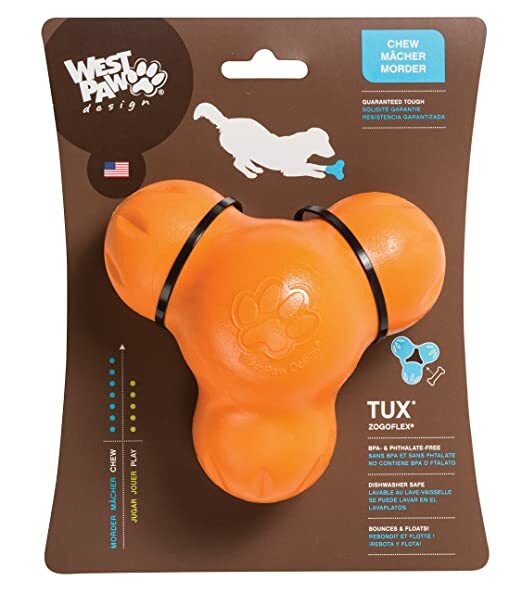 The West Paw Design Ball Chew Toy too, is a great choice to go with when it come to the best chew toys for teething puppies! The thing I love about this chew toy is that it can fit into any dog thrower and keep your puppy entertained for hours! I also like the fact that it’s BPA-free. That’s always a good thing! After all, you need to take care of that little puppy of yours, don’t you? Extremely durable and doesn’t get ruined really soon like other dog toys have the tendency to! This one bounces unexpectedly and keeps the puppy entertained for quite a few hours! BPA-free so that you don’t need to worry about your puppy’s health! What I feel is missing in this amazing chew toy is that it should have also been a treat dispenser. But, you can’t have everything you want, can you? I feel that even with these cons, this is one of the best chew toys for puppies and definitely worth a try! So, the Otterly Pets Puppy Dog Pet Rope Toy is also a great option to go with if you’re looking for a durable chew toy. It’s washable so that you don’t have to worry about your dog playing with it in the mud! Another good thing is that it comes with a reusable bag so that you can take it to the dog park without getting your bag dirty! This isn’t just a good toy for puppies, it also makes an amazing to for adult doggys! And, it cleans their teeth as well! No, that’s a good deal! I feel that this is a good buy because this one comes in a pack of three and will entertain your puppy for a while! I feel that this deserves a spot on the list for the best chew toys for puppies. This is something that will keep your puppy entertained for hours! That’s because this is a very durable treat dispenser. So, this is the perfect toy to leave your puppy with when you’re going out! No more new teeth marks on your furniture while you’re gone. It’s extremely tough and durable and you’ll get your money’s worth with this one! The best part according to me is that it dispenses treats and makes this extra engaging for your puppy! This also comes with a 100% guaranteed against dog damage so you know the brand means business! This is also dishwasher safe as well as recyclable, which is amazing! I really feel that this one deserves a spot on the list of best chew toys for puppies. Especially because it dispenses treats! Can be a little hard to hold for a tiny little puppy! All in all, I still feel that this is one of the best chew toys for pitbull puppies or any breed for that matter! 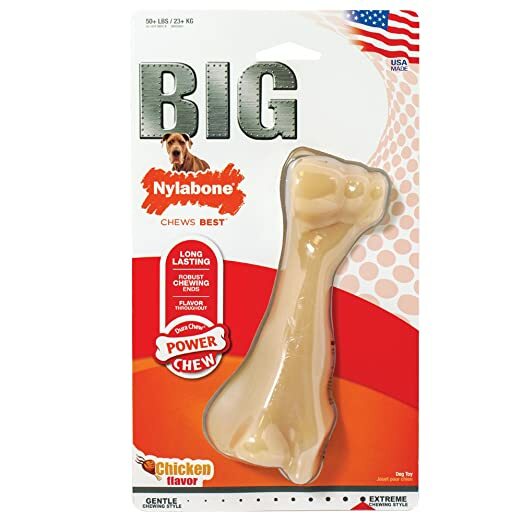 The Nylabone Big Chew Bone is also one of the best chew toys for puppies available in the market. This is for those puppies who like to chew anything and everything like furry little maniacs! Let’s talk about the features!! 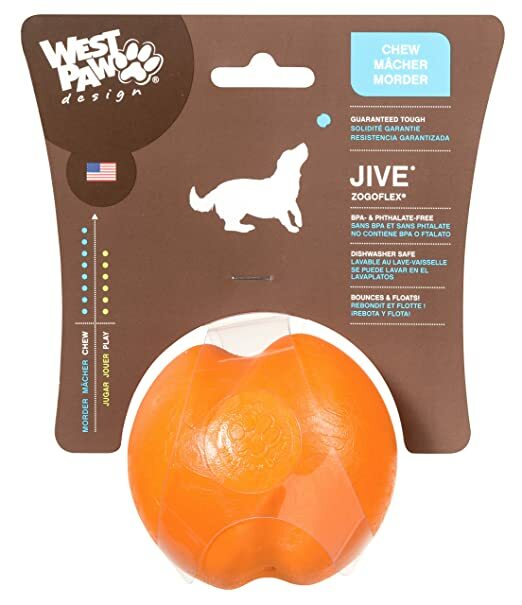 This also help keep the pup entertained for a long time so you don’t have to worry about the mess you’ll have to clean up when you get home from work! 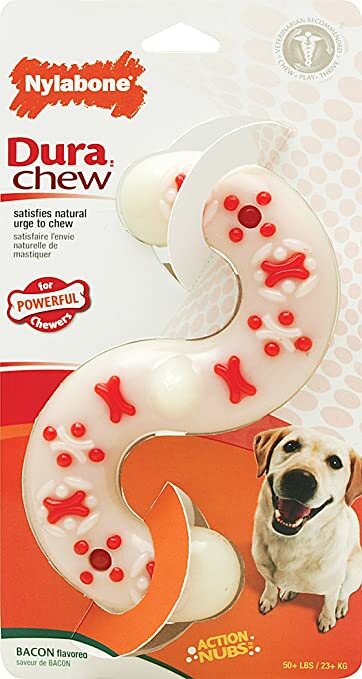 This too is probably one of the chew toys that you should really look into buying for your puppy friend! I know for a fact that the Nylabone Dura Chew Wishbone is an amazing toy for a dog. Because mine just loves it! I really love how strong and durable this one is, thanks to the material that it is made up of. All in all, I feel that this one is a good option to go with! Indeed one of the best chew toys for teething puppies. What do you think? Let me know in the comments section! 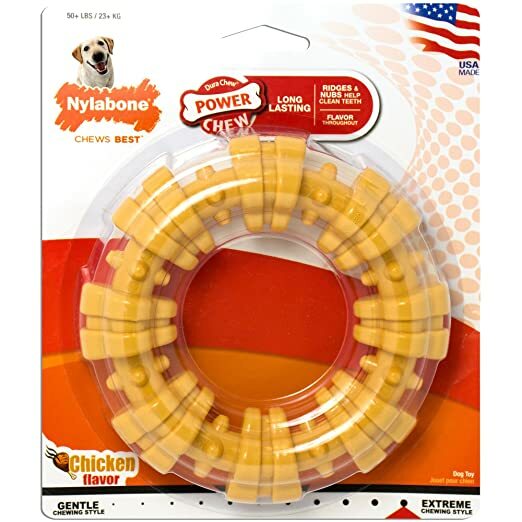 I’ve heard really good reviews about the Nylabone Dura Chew Knot and I, too, feel that this is one of the best chew toys for puppies available in the market! This is great for both puppies as well as adult dogs and will keep both entertained for a long time! Let’s weigh its pros against its cons, shall we? 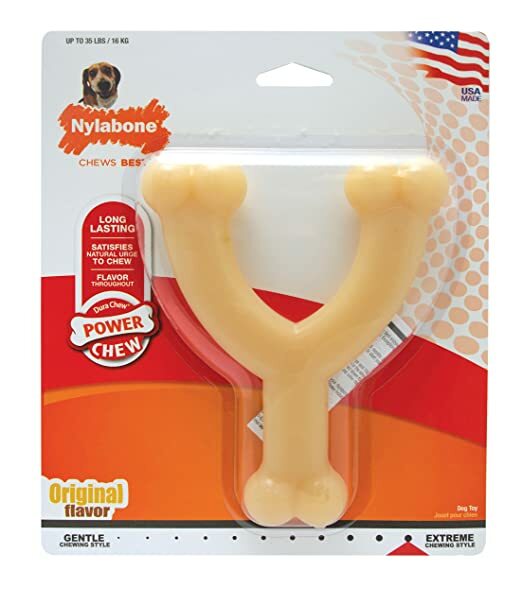 The Nylabone Dura Chew comes is a fun ‘S’ shaped design and great flavor that’s bound to keep your new furry friend entertained for hours at a stretch! Want to know its features? Here we go…! ‘S’ shape easy to pick up and chew for small pups as well as large dogs! I’ve heard several dog parents sing this toy’s praises and so, have added this one to my list of the top ten best chew toys for puppies. You won’t regret getting this one for your furry friend! 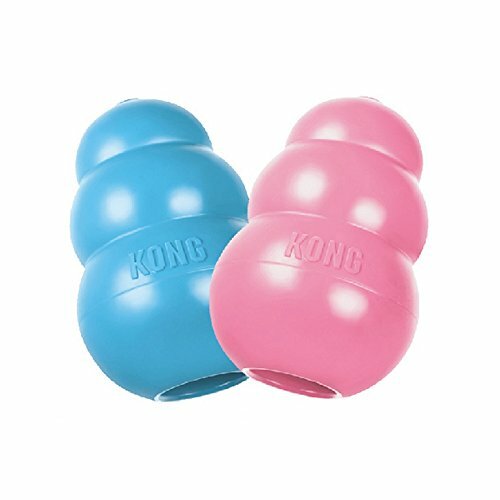 The Kong puppy toy is a great option to go with when looking for the best chew toys for puppies. Let’s talk about those features, shall we? It also bounces and adds an element of fun! This really does deserve a place in this top list! Now, let’s talk pros and cons! How do you feel about this one? Leave your thoughts in the comments section! Moving on to the last one! 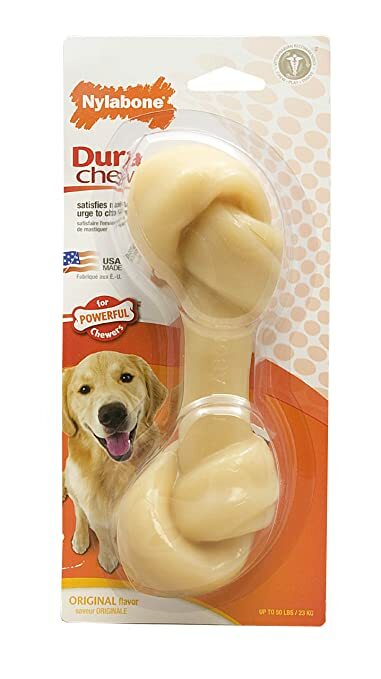 The Nylabone Dura Chew Plus totally deserves to be a part of this best chew toys for puppies round up as it’s really durable and worth trying! This one is made for powerful chewers and will last you a long time! This one’s amazing for both, older dogs as well as pups! Let’s talk pros and cons! I hope that this comparison chart makes it easier to decide which one of the chew toys is the best for your dog! Teething can be a really frustrating time for both, you and your puppy! For your puppy because it’s a really long process that keeps the little guy irritated. And, for you, because your puppy just chews on anything and everything! And so, it’s really important to invest in a good chew toy for your puppy friend. Let’s look at a list of the best chew toys for puppies! I hope that I was able to help you find the best chew toys for puppies! Leave a comment if you’ve got any questions! I’m always happy to answer your queries and clear up any concerns that you might have! Very informative. good article design, good writing.